You’ve heard of blog posts and you probably have about 300 to 500 words of content on each of your website pages, but have you heard of Super Articles? Super Articles are the most powerful type of website content you’ll find. When created correctly, these articles not only rank better (with the same SEO) than other articles, but they also attract a ton of attention. Super Articles have the ability to put you on the map. 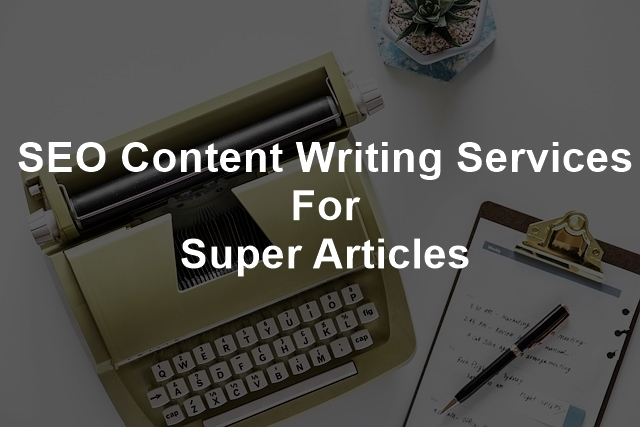 If you’ve been searching for the right SEO content writing service, you’ve found it with my Super Article writing service. Order Your Super Article Package Today by Clicking Here Now!Super Articles can be used by businesses of all different sizes. Maybe you’re a real estate agent looking to dominate your market or you want to drive traffic to your affiliate marketing website, Super Articles will help you achieve your goals! What is a Super Article? It’s important to understand a Super Article is NOT the same thing as a Link Bait Article. While a Super Article contains some elements of a Link Bait Article and can be similar in cost and length, Link Bait Articles can also be breaking news stories, long lists of tips and much more. These two can be very similar, but a Super Article will blow most link bait articles out of the water. Basically, a Super Article is the very best type of article you can buy for your website. It’s an exhaustive article, much longer than the average blog post or page, and designed to make other websites want to link to your website. These articles cover the topic in-depth and provide the reader with a real resource on the topic. Internet marketers, small businesses, bloggers and large corporations have used Super Articles to rank higher on Google, Yahoo and Bing. Much like link bait articles, Super Articles attract high quality links because they are incredibly informative and cover the subject matter in great length. However, Super Articles go beyond just attracting links. My Super Articles will blow all other types of content out of the water. When I refer to Content being King, I am referring to these Super Articles. They are the King of written content and will put you on the map! Order Your Super Article Package Today by Clicking Here Now!A Super Article takes far more time to create compared to a standard blog post or web page. It’s not something you will get from a cheap writer looking to pump out a ton of content each day. These articles come from serious writers (like myself) looking to create the very best content possible for your website and blog. While short-form content and long-form content both serve a purpose, but nothing compares to a Super Article. Most SEO and digital marketing companies will tell you that you only need 300 to 500 words of content to rank in the search engines. That’s great for the very short term, but SEO is always evolving and Google has made it very clear, longer content ranks better. It’s also important to understand, SEO and digital marketing companies want you to pay them over and over again for their services. If they sold you a Super Article, did the proper linking and promoted it correctly, they wouldn’t have you hooked on their service for months or even years. Instead, the Super Article would gain incredible traction, become ranked very high and do the job all on its’ own. Neil Patel, one of the top names in internet marketing, admits the average length of one of his articles is about 2,300 words. This is far longer than those 500-word blog posts or even those 1,000-word long-form posts you’ve ordered from other content writers. Yes, I provide those, as well, but they don’t even come close to the quality of my Super Articles. If it were up to me, all I would write would be Super Articles. However, many of my clients still think shorter content is the best choice and, in some cases, it makes sense. If you want to rank higher on Google, though, short content won’t provide the foundation you need. The best way to define a Super Article is as follows. Longer than any other article found on the 1st or 2nd page of Google for a specific main keyword phrase. This doesn’t include studies that may be found in the rankings and may be linked to from the Super Article. Skimmable and may include a Table of Contents at the beginning. Link to other top websites naturally to help attract attention. Quote and/or mention experts within the industry. Provide incredible value to the reader. Target multiple keywords within the same general topic. Include credible sources linked within the article and/or listed at the end of the article. There are several other elements that go into any Super Article. At the very core, these articles should attract attention from as many industry experts as possible and provide your readers with an incredible resource of the given topic. How Long are My Super Articles? My Super Articles range in length as no two are created equal. The average will come out to more than 2,500 words and all Super Articles I write will provide incredible value with every word. If the top results on Google are providing 1,890 words of content, I will beat that, often by several hundred words. Typically, the more competitive the industry or keyword phrases you’re targeting, the higher the word count will be for your Super Articles. This means, if you want to be average, create content at 2,000 words or less. If you want to rise above the competition and you want to actually impress Google and your visitors, you need my Super Articles! Are Super Articles Blog Posts or Web Pages? Super Articles can be used as blog posts and web pages. You can even target all your main keyword phrases with Super Articles as pages on your website, and then have Super Articles created around your tier two keywords as blog posts linking to your main pages. Maybe you have specific landing pages designed for conversion, but not designed to rank very high. Use Super Articles to funnel traffic to these landing pages and capture more leads! There are several uses for Super Articles. They can be used by local businesses to dominate the local market or by international corporations to gain incredible traffic from high search engine ranking. Whether used as a blog post or web page, Super Articles offer the very best SEO content writing you will find. Why do You Need Super Articles? I could list a hundred reasons why you need Super Articles, but it really boils down to your own goals. If you want your website to attract attention and you want to become an authority in your industry, you need Super Articles. No longer can you count on short-form content, simple blog posts and quickly written pages. You need serious content to help you rank higher today, tomorrow and a decade from now. Google will only get smarter and ranking high on any search engine will only get harder. Do you want to rank higher today and maintain that ranking or do you want to gain high ranking for a few short months just to see a competitor blow you out of the water with better content? Any SEO company can provide you with a solid link building and social media strategy. Your competition can easily gain access to the same SEO services. You need to separate your website and blog from the competition and Super Articles will do exactly that! While I certainly cannot guarantee a specific number of backlinks or a specific ranking (I am just the writer), I can guarantee to provide you with the very best content I am capable of creating. Why Not Just Pay for Links? Super Articles are used to generate links to your website and blog, while capturing high ranking on the search engines. You may be wondering if it’s a better idea just to pay for links. Buying links used to be one of the most common SEO strategies used and some website owners still buy links. The link buying economy is still very much alive and well, but it has started to decline over the past few years. According to Christopher Angus, an SEO Expert, paid links don’t provide the necessary rewards to outweigh the risks. Since Google has updated their search algorithm many times, it’s obvious the search engine doesn’t value paid links as much as natural links. Paying for links may look cheaper in the short term, but as soon as Google figures out how to spot these links, the money spent will become a complete waste. In addition, a Super Article has the ability to gain high quality links today, tomorrow, a year from now and even a decade from now. You may only get a few links at first, but the linking won’t stop after the first few weeks of publication. Often, high quality links run as much as $500 per year just for one link. With the right Super Articles, you’ll gain more links and end up spending less money over the short-term and the long term. In addition, a Super Article has the power to take high ranking on Google, generate traffic and create leads for your business. 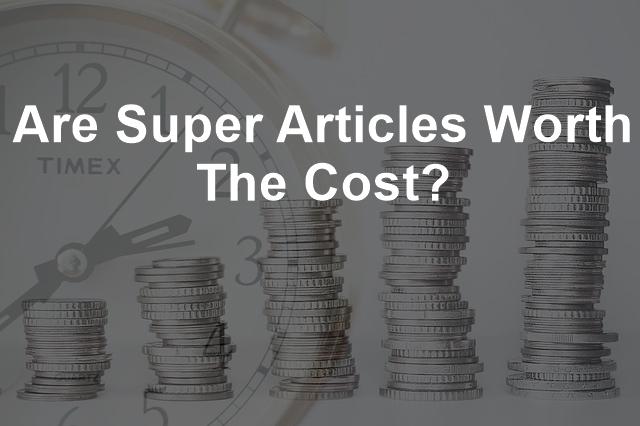 How Much do Super Articles Cost? The cost of Super Articles is hard to define as most SEO writing services don’t even offer these articles. Many do offer link bait articles, however, so I will use the cost of link bait articles as the comparison. The cost of a link bait article varies from one SEO content writing service to another. In this blog post from WordStream.com, the example shows a cost of $2,000 per article, including promotion. The promotional part is hard to assign a cost to because the article doesn’t say how they are promoting the article created for the example. Some writers charge well over $1,000 for these articles and I can understand why. They are time consuming and require a large amount of research, as you will see below when I detail the process I use to create Super Articles. I don’t provide promotion as a part of my Super Articles as I am not an expert in this area. I am an expert when it comes to research and writing. I also don’t charge $1,000 for my Super Articles. The price of my Super Articles starts at $500. I do provide discount for ordering multiple Super Articles and you can find my complete pricing here. Order Your Super Article Package Today by Clicking Here Now! Are Super Articles Worth the Cost? The short answer is YES, but let’s look at the breakdown. If you pay $500 for one Super Article and another $500 to a marketing service to promote the article, you’ll have a total investment of $1,000. How many leads/sales do you have to generate from that one Super Article to recoup your cost? Maybe you’re a real estate agent and one lead turning into a listing for a home you sell will generate a commission of $10,000+. It would only take one lead/sale for you to not only recoup your cost, but also turn a profit. Maybe you run a website hosting company and the average order generates a profit of $150. After generating 7 orders you will recoup your cost and turn a profit. Of course, this doesn’t take into consideration any of those 7 orders renewing for a second year of website hosting. It’s pretty easy to do the breakdown for just about any industry and see how incredibly valuable these articles are for any website. With Super Articles, you’ll have the high quality content you need to drive more traffic into your sales funnel. This means more leads, more sales and more profits. Just like with most things in life, you get what you pay for. When you pay for Super Articles, you get the very best content possible for your keyword phrase or phrases. 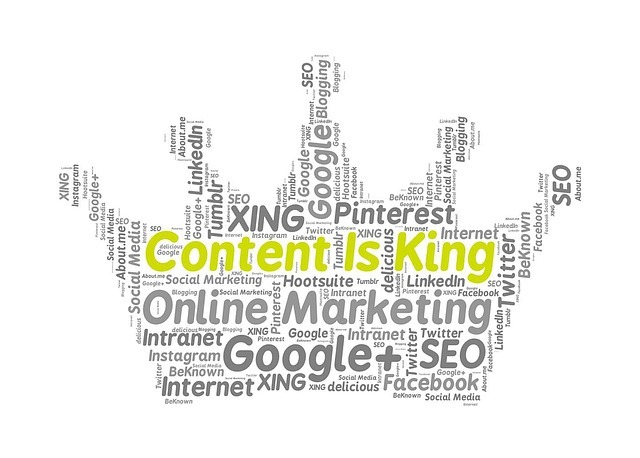 When you have the best content, you will get the best results, which will lead to the best ROI possible. The best part about Super Articles; they keep on producing leads and sales far longer than other marketing methods. If you spent $1,000 on Pay Per Click Advertising and you received 100 new leads, which led to 20 new customers, you’d have 20 new customers. However, your marketing for that $1,000 is done and won’t produce any more leads. A Super Article will continue to produce leads for years! Your ROI will just get better and better, once the initial investment has been recouped! It’s important to understand the process I go through to create every Super Article. These are highly exhaustive, long-form content pieces ready to grab top search ranking, attract attention, help generate natural backlinks and establish authority. The process is quite different compared to a simple blog post or web page. When I create a simple blog post or web page for a client, I often start with a very quick search on Google about the topic. I may pull 2 to 5 sources, depending on the length, and often go right to work on the content. The goal of shorter content isn’t the same as a Super Article and the process is much faster. Super Articles require extensive research. Not only will I search Google for the main keyword, but I will also search for three to five additional keywords on the topic. I comb through the first and second page results noting word count, the main points and sub points covered and how the content has been formatted. In addition, I use Google Scholar and a few other tools to find studies or high authority sources to reference in the article. This may include actual studies and surveys done. Once I have all the research I need, it’s time to write. Even poorly written content topping the 2,000 word mark takes time to create. Since I am creating a high quality Super Article for you, this portion of the process will take me a few hours, just to create the first draft. The article I create for you will be incredibly high in quality. It will also be topically relevant and cover the topic in-depth. The editing process is one of the most time-consuming with Super Articles. These articles need to be near perfect in many ways. While many common grammar rules learned in English class don’t apply with online content, due to the conversational tone, it’s still important to ensure the content reads well. I don’t guarantee error free content, as I am human, but I do provide as close to error free content as possible with Super Articles. Each Super Article gets edited immediately after the first draft is created in order to create a second draft. At this point, the content is pretty well set, but it’s still necessary to comb through the article for typos, misspelled words and other errors. I let the article sit for a day or two, and then, with fresh eyes, I go back through the article a third time to ensure as many errors are caught as possible! Even though I don’t Guarantee Super Articles will come out error free, I do offer a content credit if you spot any typos or misspelled words. Each error is worth a $10 credit on your next Super Article or any other content order of $50 or more! ***This guarantee doesn’t apply to grammatical mistakes as grammar is very subjective these days. However, I will gladly rewrite a sentence or paragraph if you believe it contains grammatical errors. The final part of the creation process is linking. Within the article, I provide links to other articles, studies and blog posts about the topic or to prove the point being made. This process will include adding links to authority sites, studies, surveys and more! Linking may also include adding links to pages or posts on your current website where it make sense. I don’t add links just to add links, however. Every link I add will make sense and will add value to the Super Article. I do not provide promotional services for Super Articles or outreach. However, I do suggest you tag any author or website I have mentioned in the article when you share it on social media channels. I will provide a list of the websites and authors mentioned to make this easier. There are several services far more capable than I, when it comes to promoting content. As I stated before, I am an expert writer and researcher, but not an expert promoter. What’s My Turnaround for Super Articles? If you read the section about the process of creating a Super Article, you have already figured out these take time to create. I cannot provide Super Articles in 24 or 48 hours, as the exhaustive process doesn’t allow this high quality content to be produced so quickly. My turnaround for Super Articles varies depending on how many orders I have ahead of yours. If my order queue is empty (doesn’t happen often) I can provide a turnaround of about 3 to 5 days. When you place your order for Super Articles, expect the turnaround to be longer than a blog post or web page. I will provide an estimated turnaround with your order. Are you ready to take over the top ranking for your main keyword phrases? Do you want to attract attention from the big players in your industry and finally become an authority?